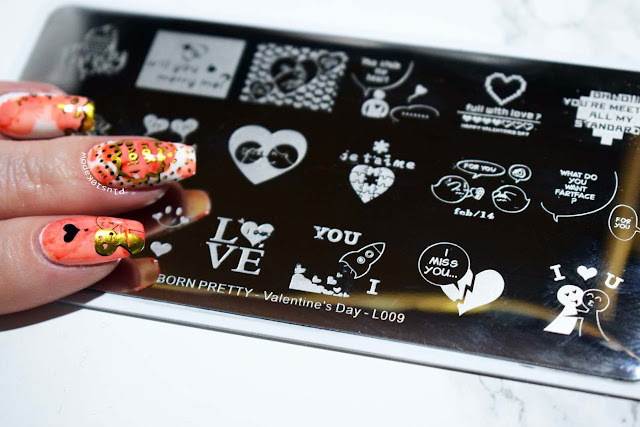 As soon as I saw the Valentine's Day L009 stamping plate from Born Pretty Store, I had to have it! Those tiny, adorable little Boos got me, I needed this plate and it has not disappointed. 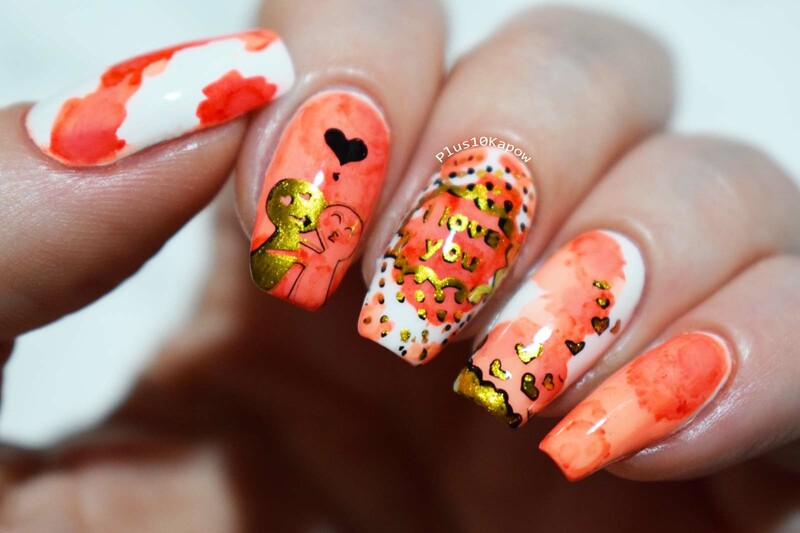 For my first nail art, I wanted to do something over the base of my Blooming nail art yesterday. I choose these adorable hugging figures. 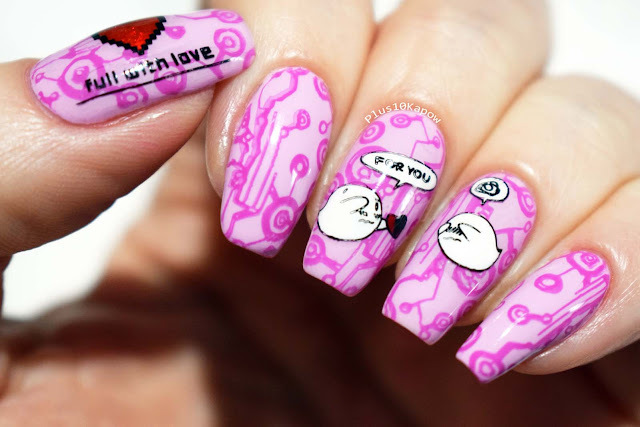 I added the pop art style "I love you" to my middle nail and then added some hearts to my ring fingers. All of these were stamped using Moyou Black Knight and then Born Pretty Store gold stamping polish, and topped off with Seche Vite. They plate picked up really well straight away and is etched really nicely. There are about 20 images, although most of them can be broken up to create more images. There is also a nice mix of regular stamping and reverse stamping on the plate. There were no imperfections although I did notice one spelling error, instead of saying "Will you marry me?" in the second image on the top line, it says "Will you merry me?" but that's just me nit picking and honestly it's not a deal breaker. Obviously I chose it just for the Boos but I later noticed that there is an 8-bit heart with a heart health bar underneath it too, which is so cute. And another image I noticed when I received the plate, that I really like because it kind of reminds me of me and Jim, the speech bubbles on the middle line, right at the end, one of them says "what do you want fartface?" it made me giggle, I love it. For my next nail art, I obviously had to use the Boos. 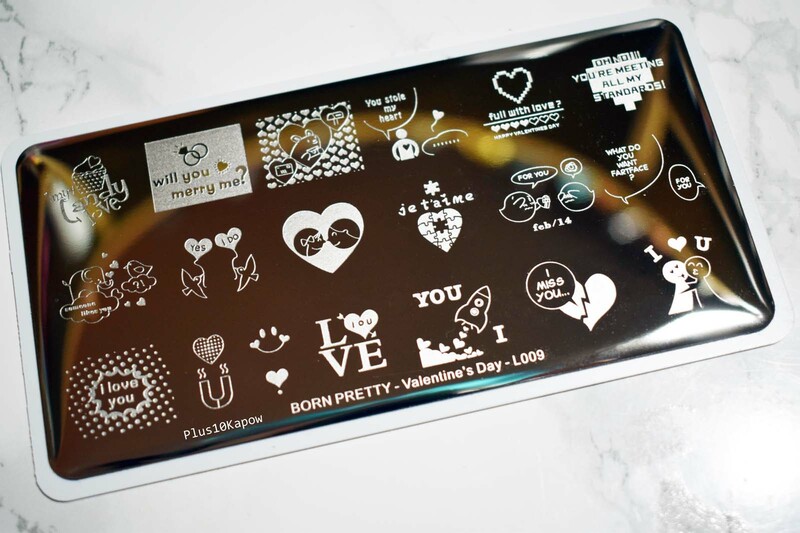 I did a base of Barry M Berry Ice Cream and stamping with Barry M Sugar Plum, I stamped a circuit board pattern using the Uberchic Geek Love 01 plate. Then I reverse stamped the Boos and their speech bubbles using Barry M Cotton and I reverse stamped the 8-bit heart using Models Own Luminous Red. 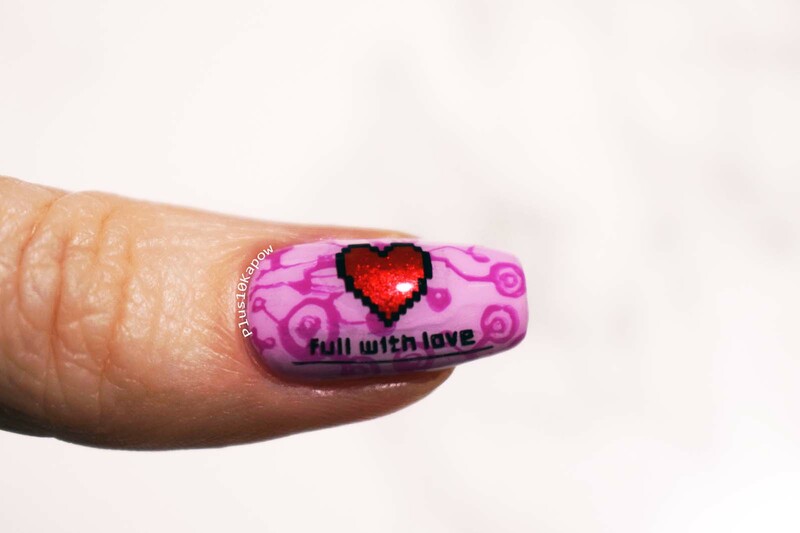 I kind of wish I added the health bar hearts to the thumb too but I really like how this whole mani turned out. It's so cute! You can find this plate here for £2.26/$2.99 and don't forget that you can use code CBAQ10 to get 10% off all non sale items.